Within 15 minutes, Salesforce.com Senior Community Manager Nathan Freitas created a video job description that was soon to go viral across the internet. Nathan's energy and enthusiasm in the recruitment video compelled people to share the job via social channels such as Facebook, LinkedIn, and Twitter. In a few short weeks, the job description had been tweeted 57 times. Wait a second, 57 people tweeted a job description? Indeed. Yes, that's rare, and yes, we're going to share how you can achieve those results too. Think about the current state of recruiting. 99% of job descriptions fail both the hiring manager and candidate. Hiring managers enter job requirements into a database that few people will ever read. In turn, candidates glance (barely) over three paragraphs of text devoid of key information about the actual team and company they would be joining. Back to Nathan. He is a high energy leader with an innovative approach to business. He was given the go ahead to hire for two open positions. He knew that it was going to be difficult to portray his style and enthusiasm to candidates in a written job description. To bring his message to life, Nathan composed a quick video. He proceeded to push the video out across his own social networks. He quickly learned that this was a viable social recruiting strategy, but the real difficulty was keeping the momemntum going behind the video. 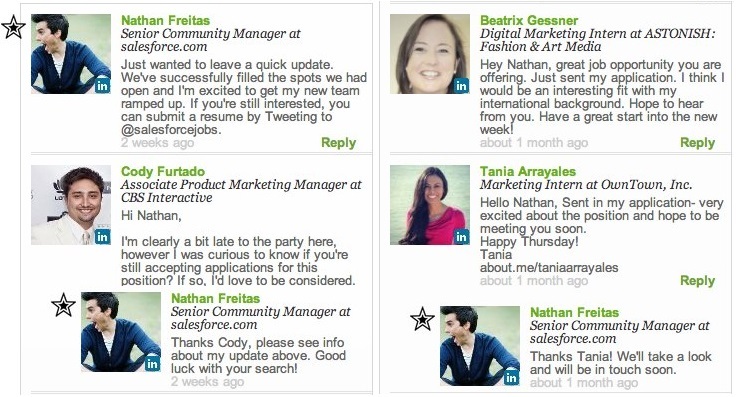 In talking with a Director of Recruiting at Salesforce.com a few weeks later, Nathan learned that the company was starting to use Ongig. As he explored the platfrom, he saw the opportunity to leverage his recruitment video within the context of a job description. Nathan logged into Ongig's platform and quickly uploaded his video to begin creating his next-gen job description. He uploaded six pictures, added the job reqs, and connected his LinkedIn profile. 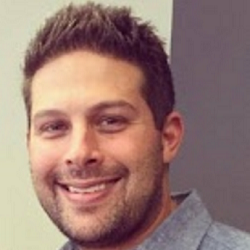 Within 15 minutes, he had one of the most shareable job descriptions on the internet. As the job went viral, Nathan learned that the video job description was doing the recruiting for him sending several candidates his way. As they watched the video, they were also looking at Nathan's background via LinkedIn. In addition, they had an opportunity to read through the requirements for the job as well as learn why the role was open. That said, people still had questions or make comments. The real-time interactivity of Ongig's chat/comment feature proved key in Nathan's job continuing to go viral. The job description compiled 34 comments. That's 34 times that someone took the time to ask a question or comment. No job description on the internet today can claim that. Nathan took full advantage of this real-time interactivity. As candidates made comments and asked questions, he was timely in responding. He was able to respond in one place for all candidates to see. This was a huge time-saver as he only had to answer questions once. The other benefit was that it kept the job description fresh and relevant. There was new information for anyone returning to look at the job again. Nathan also discovered a nice byproduct of the commenting on the job description. Since LinkedIn is used as a way to identify yourself, he could actually see the background of people in real-time. While candidates can certainly stay anonymous when making comments, several choose to show their identity. This made Nathan's process more efficient. He could easily click on their profile in the comments section and quickly rule them in or out. Perhaps the best use of the live comments/chat section was notifying candidates when the job was filled. Nathan posted a comment stating that the positions were filled, and that he was appreciative of everyone's interest. Once the comment was posted, each applicant and "follower" of the job received the note from Nathan, and knew the job was filled. Candidates appreciated the note even if they were not hired (an often missed opportunity by companies to improve their brand's candidate experience). They knew where they stood and avoided the "black hole"! Today's hiring managers and recruiters must pay close attention to the numbers. It is important to have metrics, so that you know where best to spend your time and money. In this case, Nathan knew that the primary thing he needed was engaging content that literally brought his job to life. Once he created the video, he quickly packaged the video within Ongig that included his LinkedIn profile, relevant pictures from his recruiting team, and details from the job description on the Salesforce.com careers page. The number one result that hiring managers are interested in is the actual hire. In this case, Nathan was hiring for two Community Managers. He was able to successfully hire two standout candidates. One of those hires came by his efforts in building the "social" job description. One of the candidates Nathan hired is Jared Paul. Jared had heard about the position previously, but was not sure it was the right fit for him. After watching the video on Ongig, he felt that Nathan's energy and enthusiasm matched the type of person he wanted to to work with. The result was that he applied, interviewed, and became a full-time Community Manager at Salesforce.com. Congratulations to Nathan for his progressive approach to hiring and using Ongig's Video Job Description Platform to create Next-Gen job descriptions, and congratulations to Jared as well on this awesome position with the world's most innovative company!